In modern legal practice, the difference between success and failure often boils down to the ability to navigate and make sense of data. 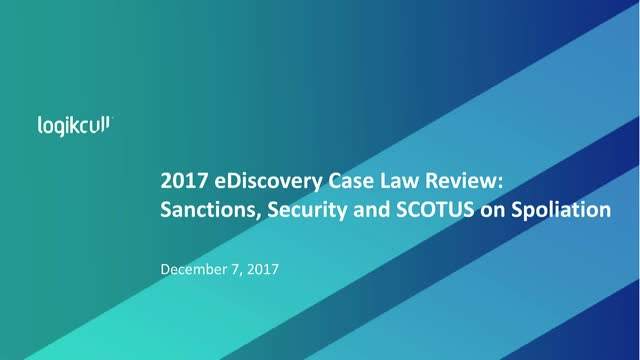 To that end, the legal profession in 2017 was largely shaped by major developments in data and legal technology, from the way in which discovery sanctions were adjudicated to news-making data breaches, such as the so-called “Paradise Papers,” where the hacking of a major law firm exposed illicit tax-sheltering practices of many of the firm’s clients. Over the course of a tumultuous year, legal professionals confronted the specter of cybercrime, a shifting of judicial views on how (and how hard) evidentiary penalties should be imposed, and the fact that the demise of a client’s case -- or a fruitful career -- can arise from a simple failure to understand how modern tech works. The Supreme Court, in the high-profile Goodyear decision, even got in on the action. Join a panel of experts, including federal judges, as we glean practical guidance from the most important cases and developments of 2017. Goodyear Tire & Rubber Co. v. Haeger, No. 15-1406 (U.S. Apr. 18, 2017): When does a court’s inherent power to sanction cross the line? Ronnie Van Zant, Inc. v. Pyle, 2017 U.S. Dist. LEXIS 138039 (S.D.N.Y. Aug. 28, 2017): Non-party sanctioned under Rule 37(e) for loss of cell phone information. Harleysville Insurance Co. v. Holding Funeral Home, Inc., No. 1:15cv00057 (W.D. Va. Oct. 2, 2017): Should privilege be waived due to inappropriate use of a file-sharing site? N.M. Oncology & Hematology Consultants v. Presbyterian Healthcare Servs., 2017 U.S. Dist. LEXIS 130959 (D.N.M. Aug. 16, 2017): Should sanctions be levied for giving employees discretion to preserve emails? Bailey v. Brookdale University Hospital Medical Center, No. CV 16-2195(ADS)(AKT), 2017 WL 2616957 (E.D.N.Y. June 16, 2017): Expensive discovery persuades court to split costs, and penalize counsel, in light of lopsided ESI agreement.